This isn’t going to be an overly long post because, if truth be told, there isn’t that much to do in Jajce but this pleasant central Bosnian town is certainly worth an overnight stop if you are travelling on public transport around the country or, a couple of hours of exploration if you have your own transport and are en route to somewhere else. 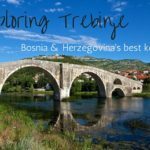 Situated 160km northwest of Sarajevo and about 70km south of Banja Luka, Bosnia and Herzegovina’s first and second most populated cities respectively, Jajce is an old town that dates back to the 14th century and once served as the capital of the independent Kingdom of Bosnia. It was the last settlement to fall to the Ottomans when they initiated their take-over of the kingdom in the middle of the 1400s but after it finally conceded to the Turks in 1527, Jajce never regained its importance as a military and political power in the region and has remained a relative backwater ever since. That said, Jajce does receive quite high visitor numbers. They are mostly domestic or regional tourists rather than ‘foreign’ tourists in the true sense of the word and they are all coming to see one thing in particular. Without a doubt, Jajce’s trump card is its waterfall. We’re not normally into waterfalls, in fact, we’d go as far as to the say that we normally avoid them like the plague but this particular waterfall is definitely worth seeing. I’m not going to use the word unique because a) it’s an overused word and b) I’m sure others of its kind exist in other parts of the world but, the thing that makes this torrent of water unusual is its location, which is bang in the centre of the town. Pliva waterfall is 22 metres high and sits at the confluence of the Pliva and the Vrbas rivers and, right behind it, are the town’s medieval walls. It is a bizarre experience witnessing a waterfall with such an unusual backdrop and, for a small entrance fee you can go down to the base of the falls to get a closer look. Personally, we think that the viewing platform opposite the town’s gas station, which is higher up and free is as good a place from which to gaze upon it. Furthermore, for an alternative, and more panoramic, vista, walk over the iron bridge that connects the town with the main road that bypasses it. When you get to the road, follow it in a northerly direction until you see a path off to the left which leads down to a clearing in the woods. From this point, the view is spectacular and you’ll be able to see more of the town, including the citadel, in the background. The walled city of Jajce isn’t that big but it’s well preserved in parts and a good place to wander for an hour or so. The Old Town is predominantly Ottoman in style, although it dates back further than this, and if you follow the cobbled streets in an uphill direction you will inevitably get to the fortress. 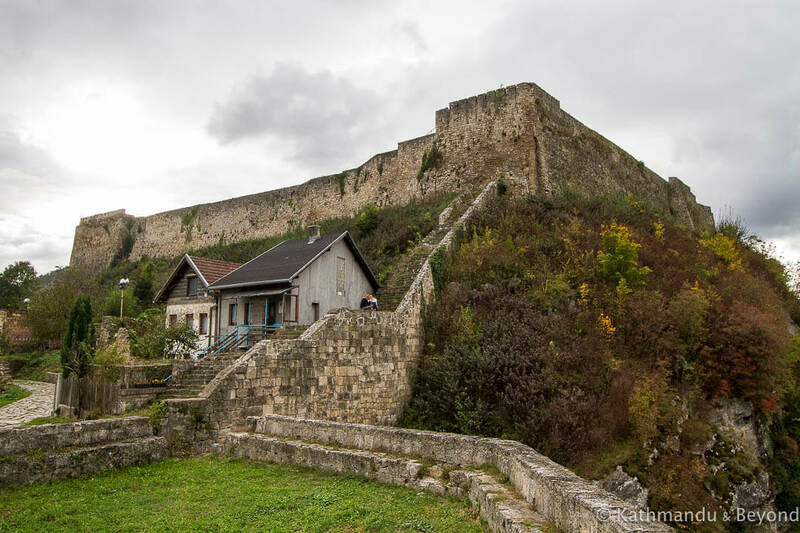 If you walk to the east of the fortress, you will come to a good vantage point from where you can either look up towards the citadel or down on the town below. Access to the fortress itself is on the opposite side. There is a small entrance fee and, although there isn’t that much to actually look at inside, there are great views from the top of the ramparts. In November 1943, the Antifascist Council of National Liberation of Yugoslavia (AVNOJ) held its second-ever session in Jajce. The meeting was attended by Tito and other leading revolutionaries from all over Yugoslavia and during the two-day event, they set out the blueprint for the new Socialist Federal Republic of Yugoslavia, which went on to be created soon after the end of World War II. The building in which the meeting was held is now a museum. Unfortunately, it was closed when we visited (even though the opening hours are supposed to be 8am – 6pm daily) and so we can’t give an opinion on whether it’s worth seeing or not but if you are interested in Yugoslavian history then it probably merits a short visit. As we had our own transport, we decided to spend the rest of our time in Jajce visiting some places that were further afield but, if you are restricted to the town and either have time on your hands or want to see more, you could search out the medieval catacombs and/or the remains of the 4th century temple dedicated to the Persian deity, Mithras (also known as the Persian invisible sun god). Alternatively, there are plenty of cafes and places where you can get something to eat both in and outside the Old Town that would provide a pleasant setting to while away an hour or so. Jajce’s other big draw is also water-based in the form of two lakes known as the Great and Small Pliva Lakes. Heaving with visitors in the summer and dead as a dodo in the winter (and also on a damp Monday morning in mid-October, which is when we visited! ), the picturesque lakes offer endless opportunities for fishing, canoeing, swimming etc. as well as plenty of scenic spots for picnics and barbecues. 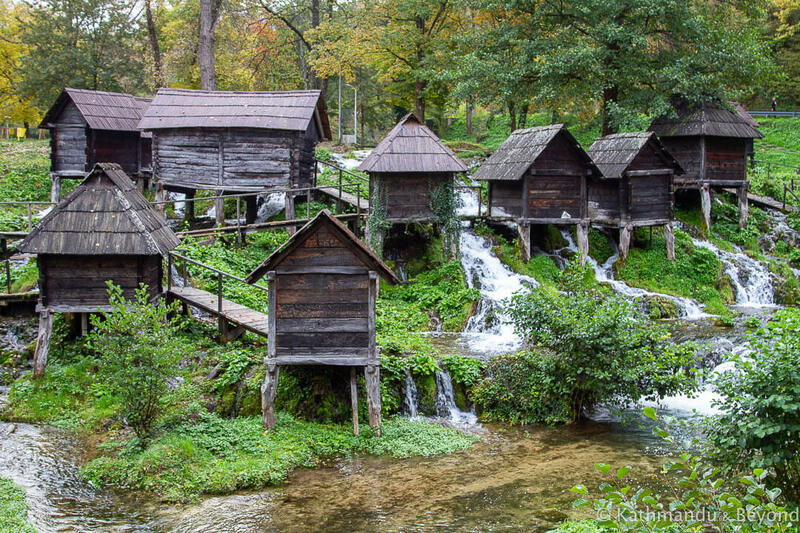 Taking the scenery out of the equation, the only real sight in the area is a series of miniature watermills that date back to the time of the Austro-Hungarian empire. The watermills, which look a little like a film set for The Lord of the Rings, stopped working a long time back but they were once fully operational and were used by local farmers. Apparently, the reason there are twenty-odd small watermills scattered around rather than one big one is that the flow of water is spread out at this point and so it was more effective to manage it this way. There is a hotel, campsite and restaurant, which presumably are seasonal, near the entrance to the Great Pliva Lake, the most accessible of the two lakes if driving from Jajce. The driving distance from the centre of Jajce to the Great Pliva Lake is 5km. We had a car when we visited and couldn’t find out if there is any public transport heading that way but it is possible to walk to the lakes. There is a path that leads from Jajce Youth Hostel all the way to the miniature watermills that stays away from the main road. The distance on foot is about 3km (or 4km from the waterfall) and if the weather is good, it is a pleasant walk. 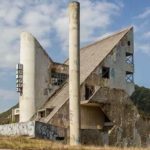 Directly on the road that leads out of Jajce in the direction of Banja Luka is the brutalist and unfinished Church of St. John the Baptist. There are in fact two churches at the site. The original Church of St. John the Baptist dates back to the 15th century and although it survived the rule of the Ottomans (when it was actually used as a place of multi-confessional faith despite being Catholic in origin) and the Austro-Hungarians that followed them, it didn’t fare so well during the Bosnian War when it was mined and then demolished in March 1993. It was subsequently rebuilt in 2000 and used as a place of worship once more. Work on the much larger church started in 2003 under the instruction of the celebrated Slovenian-born architect, Marko Mušič who’s other work in the region includes the Saints Cyril and Methodius University of Skopje in Macedonia and the splendid Kolašin Municipal Assembly building in Montenegro. Heavy rainfall which resulted in subsidence in 2014 coupled with a lack of funds means that the new church remains unfinished and very much in a state of Béton brut (translates as raw concrete but is more an expression of architectural style). 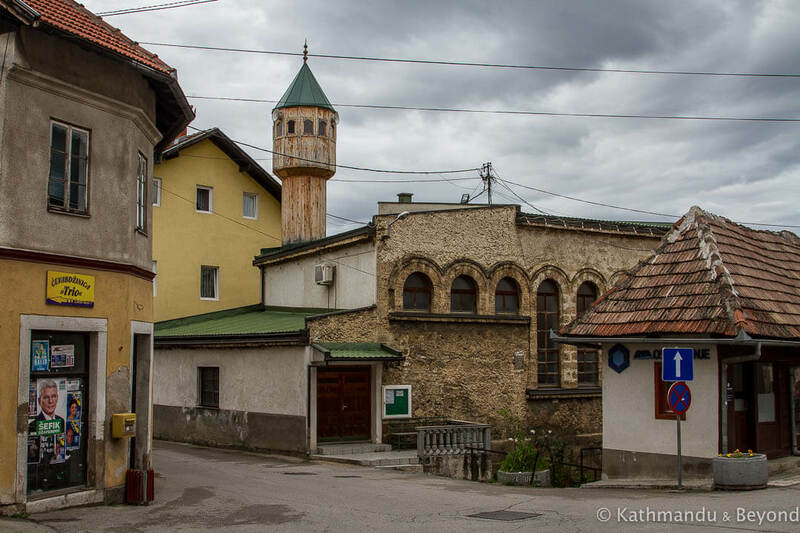 The sanctuary, which is famous among believers for its miraculous healing powers and has been dubbed the ‘Bosnian Lourdes’, is 10km north of Jajce in the village of Podmilačje. The church is clearly visible from the road and any bus travelling along this route will be able to drop you off/pick you up in front of it but the regularity of the public transport might be an issue so be prepared for a bit of a wait if you decide on this option. Driving yourself is the most convenient way to reach the church, otherwise hiring a taxi for the roundtrip journey from Jajce will also work. You don’t need more than twenty minutes to half an hour to look around. You are not allowed inside the unfinished church. Jajce has reasonable public transport options. There are buses connecting the town with Sarajevo, Banja Luka and Mostar as well as other locations within Bosnia and Herzegovina. You can also take a direct bus to Zagreb in Croatia. Visit Jajce’s website has all of the bus schedules. Other sources for up-to-date information on public transport in Jajce include the bus station itself as well as the notice board in the common area of the Jajce Youth Hostel, which is also kept up to date. Balkan Viator is another good resource for finding bus, as well as train, schedules throughout the region, although it’s not 100% reliable so it’s best to double-check timings locally. The bus station in Jajce is conveniently located a couple of hundred metres from the waterfall and the entrance to the Old Town. 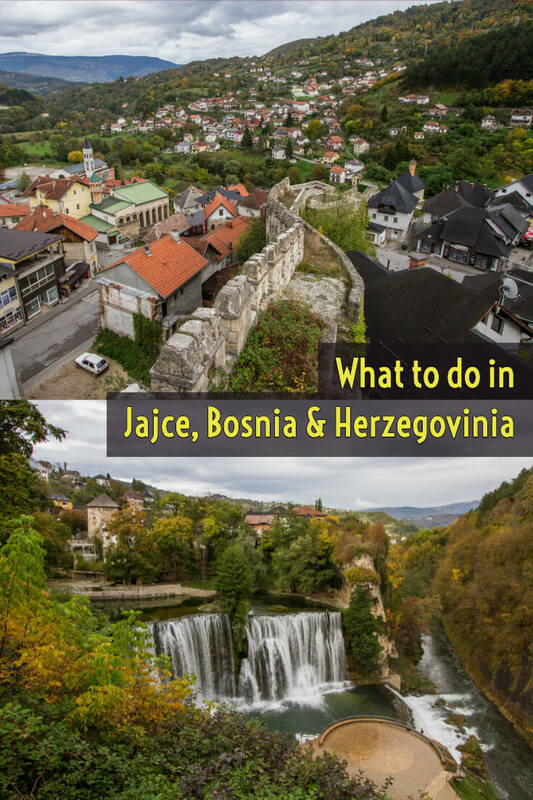 There are a few hotels in town but we decided to overnight at the Jajce Youth Hostel. 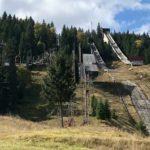 It was a bit ‘Mary Celeste’ (that might have had something to do with the time of year we were there (mid-October 2018)) but that’s not really a complaint as we personally prefer somewhere quiet. There was a reasonably clean communal kitchen, plenty of parking out the back and a large supermarket just over the road. The hostel is located about 300 metres from the bus station but in the opposite direction from the waterfall and the Old Town. Overall, it was a decent place to stay considering the price. 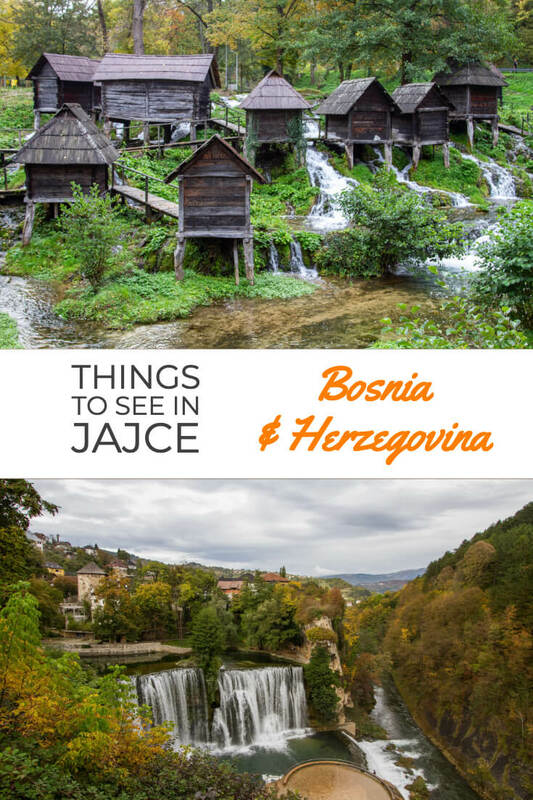 In Conclusion – Is Jajce worth visiting? 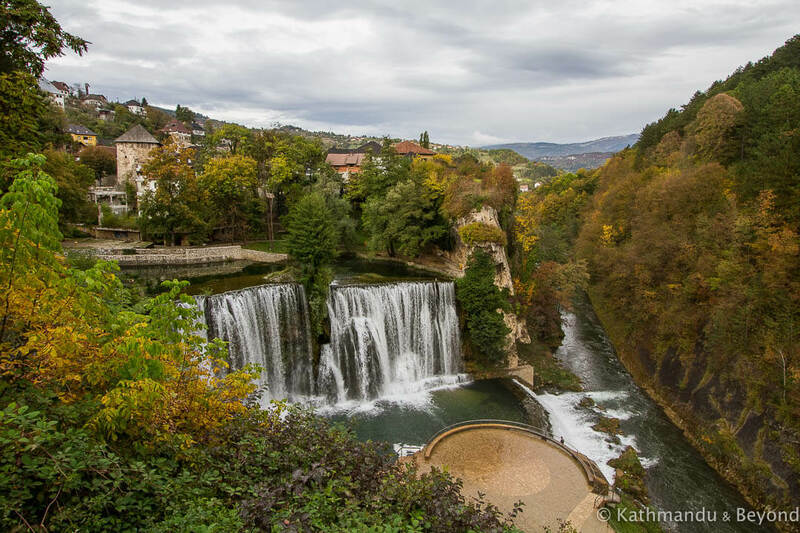 As is often the case, our impressions of Jajce are influenced by the weather and we don’t feel as enthusiastic about the place as maybe we would if we’d experienced warm, sunny days during our visit. Instead, the cold weather rather dampened our spirits. 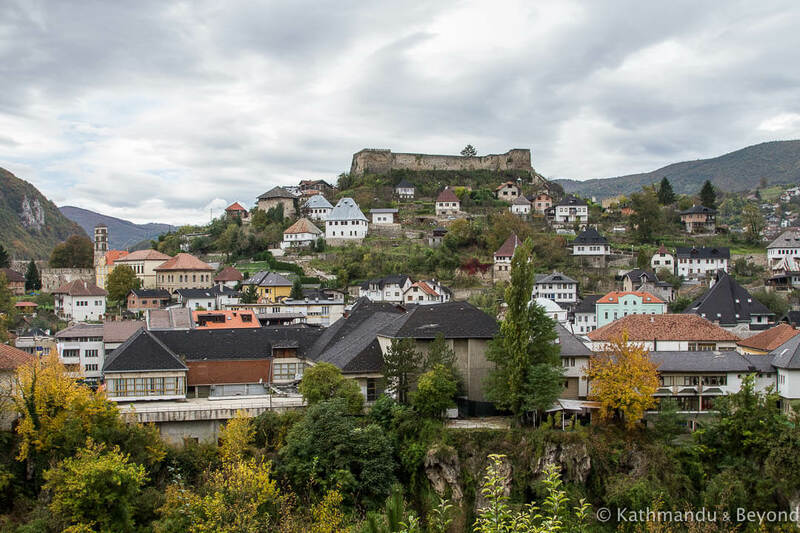 Jajce is a small town and it’s not the kind of place that will keep you occupied for days on end, but the setting and the surrounding scenery is very pretty and it definitely deserves a day or two on any Bosnia itinerary. 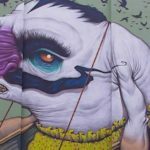 WHY NOT PIN THIS POST TO YOUR TRAVEL BOARDS?